Safely cut up to a 3” stack of paper in one swift stroke! Save time and money with a paper cutter next to your printer. Print multiple copies per sheet, print a stack of sheets, then squarely cut the stacks to create many copies. 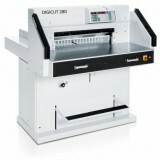 Choose from small 16” manual or electric drive paper cutters to 32” hydraulic drive programmable paper cutters. Safety - Does the cutter have built-in safety features to protect the operator during the cutting process and while performing routine maintenance such as blade changing? Construction - All steel contruction is best, a cutter with a wooden base may warp and become unstable. Easy & safe blade change; any cutter's knife blade will become dull with use and must be sharpened. The cutter's design should facilitate easy blade change and include a blade change kit. A well built cutter will last for years and have design features that will provide precise quality cuts with consistent accuracy. Ease of operation - The more automated features a cutter has the easier it is to operate. Manually operated cutters can provide precise cuts but require more operator attention to detail and could result in defective cuts due to operator error. Whereas, a digitally controlled, programmable cutter with automatic clamping and cutting greatly reduces the chance for operator error. Additionally, the more automated features the cutter has the less chance for operator fatigue, especially when cutting volumes of paper or multiple repeat cuts. Sheet size - What is the maximum sheet size you need to cut or trim now or in the future? Standard sheet sizes in the US are 8.5" x 11" , 8.5" x 14", 11" x 17" and an oversized sheet; 12" x 18". The oversized sheet is typically used for a full bleed finish for 11" x 17" or multiple up printing. If you need to trim the 18" edge on your paper cutter your cutter must have an 18.5" cutting width. Print shops or digital copy centers might want to cut from parent sheet sizes which would require a larger cutter with a larger cutting width. Some parent sheet size examples; 26" x 40", 25" x 38", 23" x 35", 22" x 34", 20" x 26". Paper type and weight - If you will consistently cut; delicate paper stock, glossy paper stock or card stock you might want to consider a paper cutter with hydraulic clamping. Having the paper pile clamped securely prior to cutting is critical for cutting accuracy. There are three paper clamping methods; manual drive clamping, electric drive clamping and hydraulic drive clamping. All three clamping methods work, but you may get varying results with different paper stocks. Manual clamping depends on the operator and can result in different clamping pressures with each cut, affecting the quality. Electric drive clamping is consistent, the clamping pressure is fixed with the same pressure applied with each cut. This fixed clamping pressure could possibly damage delicate stock however, you could use tools such as cutter pads or chip board to eliminate or reduce the damage. Hydraulic clamping offers the most versatility and control allowing the operator to adjust the clamping pressure to suit the paper stock to be cut. Hydraulic clamping pressure can be increased or decreased, once set the pressure will be consistent with each cut that follows. Safely trim a single sheet or multiple sheets with precision! Safety - Does the trimmer have built-in safety features to protect the operator during the cutting process such as a transparent safety guard that covers the blade in every position? 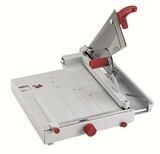 Construction - You will find paper trimmers with bases or tables constructed from wood, poly-board, plastic and steel and blades made from steel, stainless steel and solingen steel. Typically a trimmer that is higher priced than other trimmers with similiar specicfications and features will be constructed of better quality materials. Choose a trimmer with the quality level that matches your expectations on the accuracy your applications require and/or how often it will be used. Features - Clamping device prevents paper movement while trimming. Adjustable back gauge to squarely fix the paper. Narrow trim or lightweight paper supports. Re-sharpenable blade. Sheet size - What is the maximum sheet size you need to cut or trim now or in the future? Choos the trimmer that has a cutting length that will handle the largest sheet you need to trim. 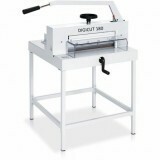 If you will need to trim a 11" x 17" sheet on the 17" side choose a trimmer with an 18" cutting length. Rotary Trimmer - Small desk-top rotary trimmers are ideally suited for crafts and scrapbooking, some of the smaller rotary trimmers have specialty blades for wavy cuts, perforating and scoring. 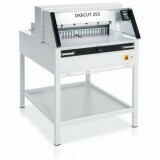 Larger rotary trimmers are ideally suited for trimming wide-format materials such as laminated signs and posters. 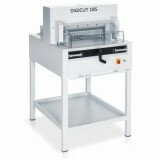 Although some rotary trimmers specifications indicate you can cut multiple sheets at one time you may not get the best result, they are better suited for single sheet trimming. A stack trimmer with a gulliotine blade is better suited for multi-sheet trimming.